LONG WAY FROM, LONG TIME SINCE: "Letter to Bly Thirty-Nine Years After Your Note to Me"
"Bly’s poetry is often categorized as part of the deep image school of writing, in which the poet employs a system of private imagery; however, Bly’s wish is not to create a personal mythology, but rather to describe modern American life through powerful metaphors and intense imagery. [...] Hugh Kenner, writing in the New York Times Book Review, remarked that 'Bly is attempting to write down what it’s like to be alive, a state in which, he implies, not all readers find themselves all the time.'" Robert Bly at the Poetry Out Loud Minnesota Finals at the FItzgerald Theater. 2009. Photo by Nic McPhee. your footprint. How did it get there? the scent of fall. 1979. The book just out. in the audience could lend you a copy. with so much liveliness and aliveness. in all of ours. All three at once. must surely be a thousand years. 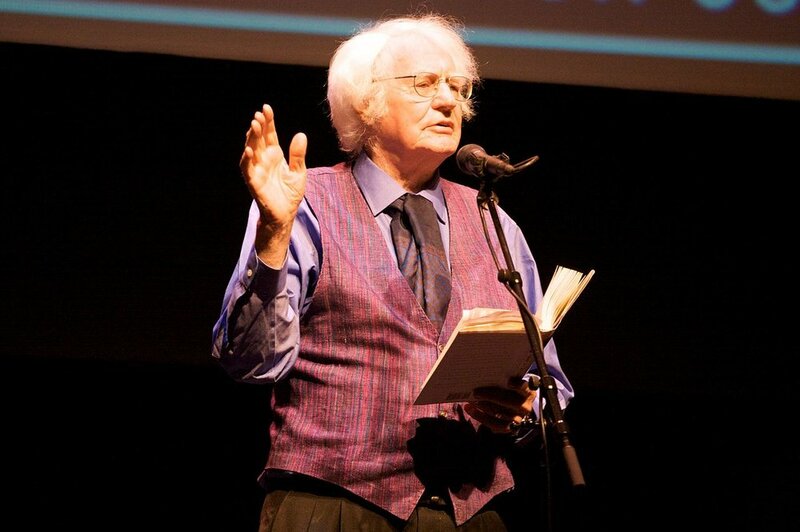 In this installment, George reads and comments on the work of poet Robert Bly (1926-- ). George Kalamaras is a former Poet Laureate of Indiana (2014-2016) and has published fifteen books of poetry, eight of which are full-length, including The Mining Camps of the Mouth (2012), winner of the New Michigan Press/DIAGRAM Chapbook Award, Kingdom of Throat-Stuck Luck (2011), winner of the Elixir Press Poetry Contest, and The Theory and Function of Mangoes (2000), winner of the Four Way Books Intro Series. He is Professor of English at Indiana University-Purdue University Fort Wayne, where he has taught since 1990. Meet George (and his beagle Bootsie, among other animal presences) in an audio interview at Radio Free Albion. The interview celebrates, in part, issue 13 of Court Green, including George's poem “Dream in Which Kenneth Rexroth Counts to Eight.” Follow George on YouTube, the Indiana Poet Laureate page on Facebook, and at the Wabash Watershed. Long Way From, Long Time Since features letters written from writers, to writers, living or dead. Send us your queries and inquiries, your best wishes and arguments, and help us explore correspondence as a creative form. For letter submission guidelines, visit our submissions page or email cutbankonline@gmail.com for more information.